Why Does Water Give Me Heartburn? Heartburn is one of the most common digestive problems. Pregnant women and older people may get more than their fair share of heartburn. When it occurs all of a sudden, heartburn may be linked to a specific eating or drinking habit like overeating, specific food, too much caffeine or a spicy dish. But when it occurs frequently, heartburn, which signifies acid reflux, may be triggered by nearly any food or drink. Still, you may be faced with the question: why does water cause heartburn? Heartburn occurs when stomach acid, and food mixture comes up into the esophagus, the tube connecting the mouth to the stomach. Ordinarily, the lower esophageal sphincter (LES) prevents the stomach contents from entering the esophagus from the stomach, so that the acidic contents do not irritate the esophagus. Note that the LES and the stomach are equipped to withstand the acid unlike the esophagus. When swallowing, the LES opens to let food or drink into the stomach. It may also open briefly when pressure builds in the stomach due to trapped gas, as happens when you belch. It could also open if your stomach is too full, or there is excess pressure due to tight clothing around the waist. In such instances, the acidic content may get into the esophagus, and cause some pain or discomfort. The stomach has too much acid-food mixture (chime). In this case, drinking water adds to the volume of content in your stomach. This may increase pressure within your stomach leading to the opening of the LES. This is similar to adding water to a bowl which is already filled with soup, in which case it would overflow. In case you drink too much water on an empty stomach. The water ends up filling the stomach such that the LES opens. Note that distension or filling up of the stomach triggers the release of stomach acid. The acid mixes with water and because of the increased pressure caused by the large volume of liquid; the open LES allows the acid-water fluid through and into the esophagus, causing heartburn. The average human stomach is the size of a clenched fist, whose capacity is about 900 ml (30 fluid ounces, or slightly less than 4 cups). However, the stomach stretches to accommodate more content, although this is not advisable because it leads to a stuffed feeling. 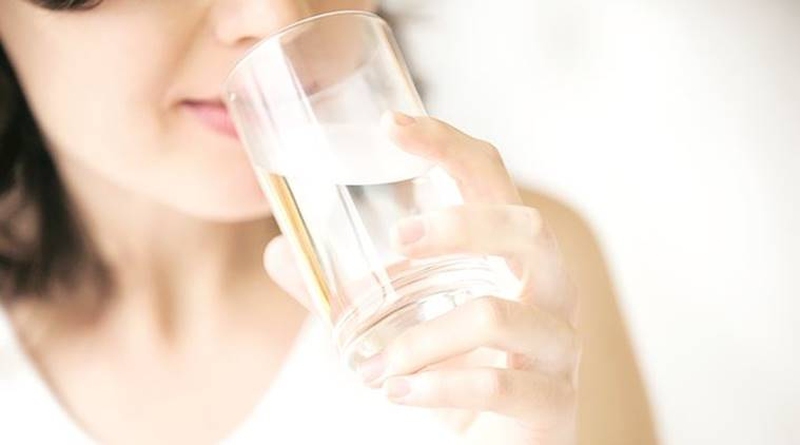 The way you swallow water can also lead to heartburn, especially if you take it in large gulps or guzzle it nonstop. And while it may not cause you to belch, when you swallow air along with water, it can cause irritation to the LES which can cause it to relax so that acid gets into your throat. Swallowing may also trigger heartburn in other ways. According to some studies, acid reflux is common if the esophageal muscles don’t contract and relax adequately when taking gulps of water. But heartburn is not always the water’s fault. Other factors could be causing the discomfort. In case you suffer from frequent acid reflux, an action like lying down soon after a drink of water can cause heartburn. Additionally, vigorous physical activity such as a workout may stress the digestive system and trigger heartburn. Too much stress can also lead to acid reflux, in which case drinking water may seem to cause heartburn even though your stomach is otherwise empty. Being overweight and smoking are other factors in recurrent heartburn. Avoid taking too much water at once. Instead, sip the water slowly. Avoid drinking cold water. Opt to drink water that is either warm or at room temperature. Cold water can trigger esophageal spasms which can lead to heartburn. Avoid taking water immediately before, during, or immediately after a meal. Form a habit of drinking water on an empty stomach instead. Fatty meals, including meat. These slow down digestion and therefore, emptying of the stomach. If the question "why does water give me heartburn" is still bothering you, note that this is more likely to happen if you are more prone to acid reflux. In the event that the lining of your esophagus is irritated in such a way that even water causes heartburn, you need to consult a doctor. Besides being uncomfortable, when left untreated, recurrent heartburn also increases the risk of esophageal cancer. It is possible to manage acid reflux and therefore, heartburn by making some lifestyle and dietary changes. However, if you don’t get relief from these, you should see a gastroenterologist who will investigate if there is an underlying problem. You might need to undergo surgery in case you have hiatal hernia.